If you have a refrigerator that isn't maintaining temperature or is continuously running and making loud banging noises, it may be a sign the compressor is on its last legs. It will most likely finally give out at an inopportune time, and you run the risk of losing all the fresh food if you don't catch it quick enough. While you know it's dying, it may be a good idea to start the search for a suitable replacement. French Door Refrigerators: What Makes Them So Great? What Does the RF1H4FENBSR Have To Offer? The prospect of appliance shopping may not excite you, and in fact, it may fill you with a certain amount of dread. You and the family are on a budget, and you don't want to invest a ton of money into a new refrigerator. At the same time, you recognize that it is the most essential appliance in your home being the primary source of food for the family. You don't eat out much and as part of your budget have cut back on takeout and the like. Therefore, you prepare a good majority of your meals at home. A refrigerator is not something you can afford to live without for any length of time. You have a smaller soffit for your refrigerator, and because of the layout of the kitchen, you can't have anything that comes out much farther than the counters. You currently have a top freezer model, but you are intrigued by the popular French door units. Will it work in your smaller space? What are the pros and cons of that style of refrigerator? The Samsung RF18HFENBSR might be worth taking a look at. Between the French door style and slimmer dimensions, it may give you the fridge you want and need at a price point your budget can live with. French-door refrigerators have been glamorized of late, primarily by home improvement and cooking shows on your favorite do-it-yourself network. It seems like everywhere you look, everyone has one. What is the big deal about this style of appliance? The critical feature of the French door refrigerator is it puts your most accessed appliance at eye level – the refrigerator. In top-freezer models, you typically have to stoop down to check out the middle and bottom of your fridge. The French door model puts an end to this stooping and puts everything at eye shot. The side-by-side refrigerator was designed to conserve space around the kitchen when the doors were open. The reduced size of the doors in that style allows anyone to have one or both sides open and leave plenty of walking room behind. The French door model continues this tradition. Both doors just open to the refrigerator. No more trying to sneak past your brother when he's gazing listlessly into the fridge. Nothing is quite as annoying as trying to cram stuff into a refrigerator. While many models available have flexible or movable shelving, it never seems to be enough. You may look at it and still not be able to get that 9 x 11 pan of lasagna in there along with everything else. The French door model gives you so many chances to rearrange shelving and food to better fit your needs. If you need to store three pans of lasagna, you can do so easily since the horizontal space is so much larger than a side-by-side. If you want to break up the shelves into various sizes and orientations, go for it! You have all the flexibility in these types of refrigerators to utilize every square cubic foot available. Samsung has been well known as an electronics manufacturer. They have manufactured and distributed televisions, cell phones and tablets for many years. They made the jump into making appliances a decade or so ago and has since become a leading provider of household appliances. Samsung has become synonymous with technology and innovation. It is not a surprise that they are leading the charge for making smart appliances that can be controlled and monitored by cell phone or by a home-wide "smart" system. While the RF18HFENBSR is not considered part of their "smart home" offerings, it is a solid and reliable choice for those who are not concerned with televisions or WiFi in their refrigerators. It is a simple model, and yet offers much more than just a place to store your food. 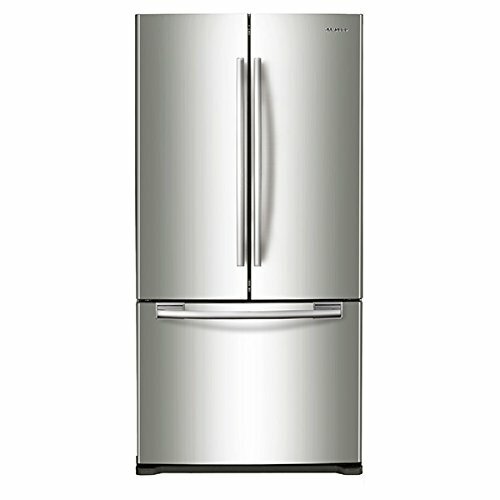 First off, the RF18HFENBSR is perfect for those looking to keep their refrigerator in a smaller soffit or area. It is what is considered "counter depth" and will integrate nicely with the counters to look seamless. Its capacity is 17.5 cubic feet combined between the refrigerator and the freezer, with the majority of the space being in the fridge (11.8 cubic feet). The freezer, although coming in smaller, utilizes a two-drawer system for storing shallow items in the top drawer along with the ice receptacle. This top tray smoothly slides back to reveal the deeper drawer underneath. Depending on your organizational skills, you can fit a plethora of meats, breakfast pastries and leftovers in this space. Remember the lasagna pans? You can cover them for easy freezing and drop them down in the bottom, where they can remain until you are ready to pull them out. The RF18HFENBSR utilizes Samsung's patented Twin Cooling System to regulate the temperatures of the refrigerator and the freezer. Most cool air in traditional refrigerators is blown into the refrigerator from the top because it is also being blown into the freezer at the same time from the same compressor. From this entry point, it has to be forced to the middle and bottom. If you have ever had a difficult time keeping items on your lower shelves from spoiling quickly, it may be due to insufficient circulation of air throughout the receptacle. Not so with the Twin Cooling System in the RF18HFENBSR. The way it accomplishes this feat is by the use of two separate compressors and evaporators to cool the refrigerator and freezer separately. The different cooling systems lend to increased energy efficiency, better temperature control and maintenance, plus odor and flavor control. No more onion "smell" seeping into the chicken you just put in the freezer. The two compressors are also a bonus if one should ever stop working. It may not lead to a total replacement but rather a single element job. The Twin Cooling System also keeps food fresher longer because the air is not struggling to refresh and circulate throughout the entire refrigerator. The surround circulation also keeps that cold air flowing evenly throughout the refrigerator to keep the food on the bottom just as cold as the offerings on the top shelf. It also stops that annoying tendency of food on the top shelf to freeze since the cold air is no longer concentrated at that spot. The shelves are tempered spill-proof glass that can be moved to accommodate your needs. The bins in the doors are also moveable and strong enough to hold milk and other bulky items with ease. The doors are easy to open and close even when they are packed with groceries. Finally, bright LED lights illuminate every part of the refrigerator and freezer, allowing you to see just what you have more easily and without the need to turn on overhead lights. If your budget is running particularly tight, be sure to ask your local appliance store if they are running any sales. Many times, manufacturers will bundle savings, so if you need a microwave or other appliance, you may be well served to try and get both as it may save you money. Also, know when the sales typically happen. There are always good savings at major federal holidays such as Labor Day, Presidents Day and Memorial Day. However, this doesn't mean you can't get a great deal on any other day. Do some looking around online to check local inventory at stores such as Best Buy, Home Depot, Lowes, Sears and other large appliance stores. They may also have scratch and dent options, including floor models at deeper discounts for often insignificant markings or dents. You may also want to see if the RF18HFENBSR is being phased out as this would allow you to grab an excellent product for a fraction of the cost. The original manufacturer's price of this unit was $1,384.00. At the time of writing the average sale price was $1,100. Take a look at three of our top picks that are worthy to go head-to-head with the RF18HFENBSR. Refrigerators can be tricky to compare because often they are so similar in offerings. However, the RF18HFENBSR did have some clear wins, especially at this price point. For instance, the Twin Cooling System is unique and keeps food fresher longer. This is just one feature that makes this model a standout. It's never a great time to replace a major appliance like a refrigerator, but when the time comes, it's essential that you have some basic idea for a replacement. If you are looking to make the switch into a French door model, the Samsung RF18HFENBSR should be a top candidate. The space you will gain, even with the narrow dimensions and shallower depth could be beneficial and allow you to keep more food on hand. The Twin Cooling System may be a game changer concerning your grocery bill in that you may have to throw away less food as it keeps the air circulating and the temperature maintained adequately. While there could be some upgrades, if you don't care about other features (such as ice and water dispenser or in-door technology options), then simple is the way to go. 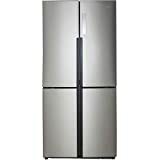 After looking at some of the other competitors, the strongest being the Haier, the conclusion we've come to is the RF18HFENBSR is an excellent refrigerator for budget-conscious families. 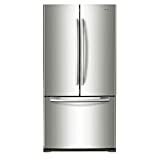 Samsung has always been competitive in terms of innovating their products most especially there refrigerators. One of its best product is RF18HFENBSR which have different good features and some of those are, it has a ice maker in the freezer that make it very quick to mold ice. However, the ice in the freezer might fall out of the receptacle and down into the bottom drawer.